Powers: He has the same ability as his grandfather and was also able to absorb the powers of any meta-human or alien he touched. Will Everett grew up with his grandfather the golden age Amazing Man after his father Will Everett II had joined the army and subsequently been killed. His grandfather told him all about his adventures but when he later developed cancer Will saw it as a result of his powers. He always wished to live a normal life “free from his family’s curse”. While in college he started having dreams which revealed his then emerging powers. Despite reluctance he eventually embraced his powers despite thinking they would result in his death. Will Everett III Continued on his grandfather’s heroic tradition, joining the Justice League by a request from Wonder Woman. While a member, he was Vital in the Defeat of Overmaster alongside the other members of the League and some reformed members of the Cadre of the Immortal. Soon after Captain Atom formed a splinter group of the JLA called ” Extreme Justice”. He remained with the team until it Disbanded. Later, Will joined the unofficial re-grouping of Justice League Europe led by Crimson Fox. Until Their single ill-fated adventure.Where Will ,Crimson Fox and Blue Devil were apparently killed by a supervillainess named the Mist. 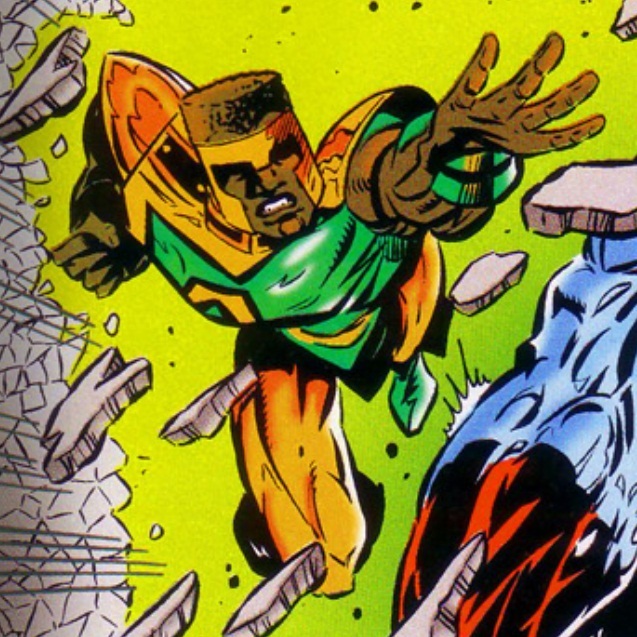 In Amazing-Man’s case, Mist had Fooled him into mimicking glass, then shattered him. Markus Clay (his Cousin) is the new Amazing-Man. I’m not a fan of making a villain or threat seem instantly super deadly by having them off established but less popular characters. It’s a cheap tool and a lazy writer should be willing to do it in better ways than “breaking other toys in the box” so others can’t play with them.These guys deserved better.